I confess I felt like a complete wimp when d’Arry and Chester Osborn turned up to meet me. They had come that day from a lunch in Edinburgh, followed by a tutored tasting 60 miles away in the Highland town of Aberfoyle, and now here they were hosting a dinner to taste through their extraordinary range of wines. A busy enough schedule for any of us, but considering that a couple of days before they’d been doing a similar round of events in San Francisco, and that d’Arry is in his 77th year, and you too might feel a little underpowered in their presence .d’Arry’s son, Chester d’Arenberg Osborn, is Chief Winemaker these days. He is also one of the most recognisable figures on the world wine circuit, with his mop of unruly, sandy-coloured hair. Chester is also the main spokesman, whilst d’Arry, d’Arenberg’s Managing Director, is very content to take a back seat – apart from pitching in with the occasional correction, just to keep the whippersnapper in check. In fact Chester is a highly accomplished winemaker in his own right of course. 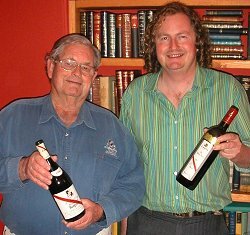 Having graduated from the famous Roseworthy College he toured extensively through world wine regions, including vintages at Hardy’s Chateau Reynella, and estates in France, Italy, Germany and Spain, before finally taking over the reins from his father in 1984. Today, d’Arneberg is undoubtedly one of the most respected names in New World winemaking, particularly amongst enthusiasts and wine buffs. Their huge and eclectic range of wines, from Shiraz/Viognier blends to sparkling Chambourcin, might not have made them a household name with the average supermarket shopper, but the quality and quirkiness has established d’Arenberg in the upper echelons of Australian wine. The latest blessing is perhaps the most commercially significant so far: with Robert Parker awarding their 2001 “Dead Arm” Shiraz a 98+ rating. Chester is a little bemused: “Parker gave several earlier vintages 96 and the wine sold really well, but there was no hysteria. Now we get 98 points and people are going crazy for the wine”. One of the most distinctive elements of the d’Arneberg family of wines is their colourful names: “‘The Feral Fox” Pinot Noir, the “Broken Fishplate” Sauvignon Blanc, the “Money Spider” Roussanne or the “Laughing Magpie” Shiraz/Viognier. All of these are explained by Chester, in such an enthusiastic way that the quirkiest titles suddenly sound eminently logical. “We thought that calling the wine after the Magpie, a black and white Australian native bird, was a great way to highlight the blend of black (Shiraz) and white (Viognier) varieties in the wine”. Chester is an eminently likeable character, and I have rarely enjoyed an evening’s conversation so much. But beneath the wild man looks and bounding enthusiasm beats a passionate heart that is absolutely committed to his wines, and to the minutiae of what makes them special. Chester lovingly describes his old rubber-toothed crusher, which came originally from Burgundy, and is so gentle in operation that any meandering lizard unlucky enough to get into the action can make good its escape. 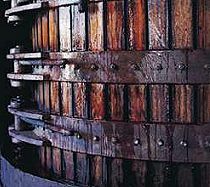 Their wooden basket presses date from the 1860s, and whilst the gentleness of their action is exactly what he wants for his wines, he recognised that for his whites it exposed the juice to too much oxygen. His solution? An Heath-Robinson-style contraption that encases the press in plastic sheeting, and involves buckets of dry ice. Along perhaps with Randall Grahm of Bonny Doon in California, Chester and d’Arenberg are one of the most innovative, trend-bucking (or trend creating?) wine operations in the world today. Of course innovation is no good without quality, and it is the quality and value for money that extends across the d’Arenberg range that really impresses. I was fascinated by Chester’s insistence that his decision on when to harvest is done purely on eating grapes from the vine to see if they taste ripe and ready. He told me he’d just nibbled his way around 18 Napa Valley vineyards, without tasting a single drop of wine. Each lot of grapes is pressed and fermented separately in five ton lots, and aged in separate barrels giving Chester a broad palate of components at blending time. The tasting of new releases and some old wines from d’Arenberg’s cellars was not blind. Interesting to taste this wine that pre-dates the Dead Arm, but comes from much the same vineyards. It has a touch of green, underripe character with liquorice and briar. On the palate there is plenty of mellow fruit that is soft and cedary, with easy-drinking tannins and just enough acidity. This perhaps suffered from being open a little too long before we tasted it. Very good on this tasting. In fact, a blend of Shiraz and Grenache, so no wonder the French got upset with the old Australian labelling! This is a big, warm, ripe wine with a touch of VA and some fine floral and confiture notes. The palate is smooth, with rich, full flavours and texture, and still terrific fruit sweetness. This has lovely balance and great length. Really fine, and excellent. The second ever vintage of the Dead Arm, named because of the disease (Eutypa Lata) that affects one “arm” of these ancient vines, the effect being to concentrate the remaining fruit. It has a big, hugely ripe, mulberry nose with a touch of volatile acidity. The palate has lovely prune and berry flavours, with some sour figgy notes and a dried cherry character. It has really good length still, and a soft but adequate tannins and acidity. Very good indeed/excellent. This growing season was cold that the grapes had very few pips, and subsequently lower tannins. IT has a marvellously ripe, sweet blackcurrant nose with some cracked black pepper and little floral highlights. The palate is silky and deep, with hints of cocoa powder, earthiness and game, but a raft of sweet black fruit well-supported by polished tannins. Balanced, good length, and excellent. d’Arenberg Dead Arm Shiraz McLaren Vale 2001 – P.O.A. Vibrant, sweet, ripe fruit suggesting mulberry and autumnal berries, with hints of sweaty saddle leather. Palate is concentrated but fine, with a keen edge to the acidity, and plenty of supporting tannins which are ripe and polished. The palate is big and deep, with a chocolate/damson depth to the fruit. Great length suggests that, whilst a touch monolithic now, this will improve over the next few years. Excellent. d’Arenberg Derelict Vineyard Grenache 2002 – P.O.A. This was a barrel sample of this new wine, from a vineyard which had lain derelict since 1985, when the Australian government paid farmers to pull up vines. These were not pulled up, but abandoned, and were still clinging to life when Chester discovered them a decade later. Vibrant, deep purple colour. Soaring nose of kirsch-like, concentrated fruit with jammy ripeness. Lovely palate which is pure and loaded with herbal-edged, pure blueberry fruit. Fine old-vines concentration here with extraordinary length. This is extremely promising and excellent. d’Arenberg Sticks and Stones 2002 – P.O.A. Another barrel sample, this is a blend of 45% Tempranillo, 43% Grenache and the rest is Sousão, a Douro variety which Chester says adds a lean edge of tannins and acidity to the ripeness of the Grenache and Tempranillo. The nose is smoky and tobacco-tinged, with a depth of blue/black, tight and glossy fruit. The palate is fine and tight, with a grainy tannined texture, and some real grippy structure as well as plenty of berry fruit. Lovely quality and good length, with a balanced finish. Very good indeed. Unfortunately this rare old wine had been open since a lunch-time tasting and had not survived the day very well. Pity, as there were vestiges of sweet fruit and complexity, but all diffused and overwhelmed by too much oxygen. This is a blend of around 70% Grenache, with 25% Mourvèdre and 5% Grenache. It has an attractive nose, with a certain peanut-shell note, but then masses of fine, extremely vivid fruit. The palate is deep and glossy, with lots of redcurrant and blackberry fruit flavours and good length. Very good indeed. Just a brief note on this wine, which contained no Mourvèdre. It has a big, intensely peppery nose with some sweaty, leathery notes and a touch of vegetal earthiness. It has masses of fruit on the palate, very big and bold, with fine tannins and lowish acidity leading to an opulent impression in the mouth and into the finish. Very good indeed/excellent.